Charlton forward Marvin Sordell says scoring his first senior hat-trick will boost his own confidence as well as aiding their bid for survival. The 23-year-old scored all three goals in the win over Sheffield Wednesday to lift the Addicks two points clear of the Championship relegation zone. He told BBC London 94.9: "I'm quite disappointed with how my season has gone with the goal tally. "It's a relief to get some more goals and help the team as well." He added: "To be able to get that match ball is brilliant." 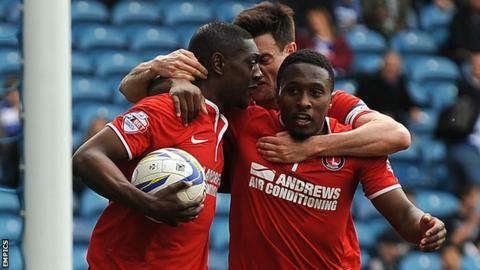 Sordell, who is on a season-long loan at The Valley, had only scored four goals for the Addicks before Easter Monday's match. Charlton were forced to fight back from being two goals down inside eight minutes at Hillsborough but Sordell levelled the scores at 2-2 before half-time, and then hit the winner just after the hour mark. The victory lifts the south east London club up to 18th in the table, with a game in hand on the bottom three. "Being 2-0 down it is hard to get back into the game," Sordell said. "You could see the character in the team and how much it means to us at the end, with people throwing their bodies on the line. "Three points at this stage is vital and it lifts the team. "It gives us a great opportunity and takes us up a couple of league places. All of a sudden we are looking up rather than looking down." Charlton head coach Jose Riga praised Sordell's application in training after his vital contribution in the victory over the Owls. "I know what he has done in the past and we are looking for him to be able to do it again," Riga told BBC London 94.9. "During training sessions he did very well and was doing what we were expecting. "It helps a lot and was the best answer he can give, certainly in this type of game."